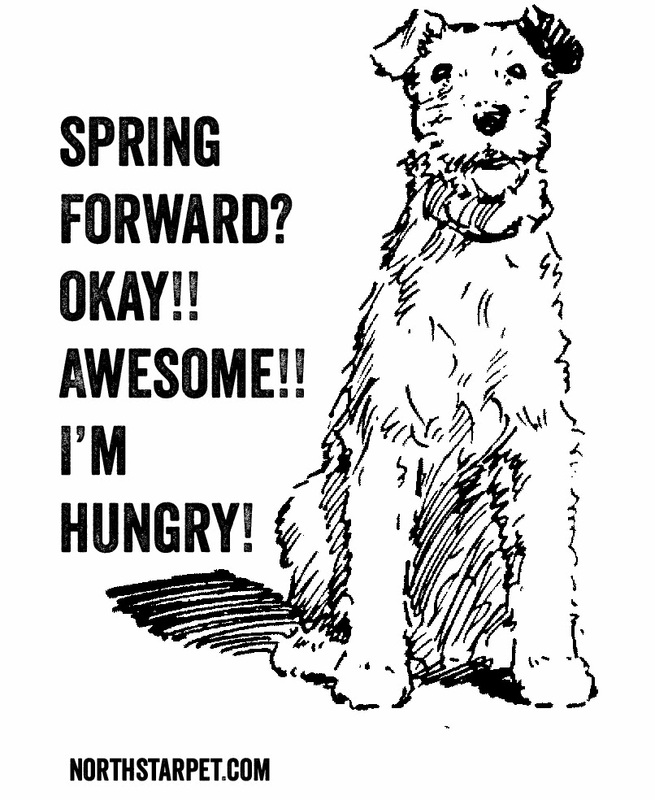 Just a reminder - Spring Forward at 2 a.m. on Sunday, March 9th! Time and time-keeping are a human construct and, yes, it's weird to us those first few days after a time change. But our pets don't watch the clock, so, they may notice the change as well, based on our behavior. They still want to eat when they are hungry and be able to go out when they are used to going out, regardless of what we humans see on our computers, alarm clocks, watches, and phones. What you may want to be aware of is that their temporary confusion because your schedule is different can become stressful. From sleep to hunger, dogs, cats, and other animals, including livestock and free animals (as in skunk and coyotes) operate biologically (circadian rhythms) and in relation to natural sunlight. If you aren't already doing so, Cesar Millan suggests mixing up timed activities like eating, walking, and playing by increments of time (early or later than what you've been doing the past six months) working toward the time adjustment weeks before the time change. Additionally, if your pet takes medication at certain times, especially insulin, have a transition plan in place or check with your vet to adapt to the time adjustment. And, otherwise, just being aware that it may take a few days to a few weeks for your dog to adjust, so extra attention and patience will help the transition. Sarah Wilson, author of the book Dogology:What Your Relationship With Your Dog Says About You advises, "If your dog wants to sleep in, let them for as long as you can. Don’t you wish someone would do that for you?" Cesar Millan on Daylight Savings Time. Time change advice and info from Dogster.